The following is a Lenten reflection by Archbishop Jose Gomez that originally appeared on the Archbishop’s website on March 11, 2019. Most Rev. Jose H. Gomez is the Archbishop of Los Angeles and serves on the Bishops Advisory Board of The Rome Experience. This Lent, we want to try to enter more deeply into the mysteries of the life of Jesus Christ, to follow him more closely, to commit ourselves once more to making his life the pattern for our own. Humility is the key that allows us to enter into the heart of Jesus Christ. “Learn from me, for I am meek and humble of heart,” he tells us. When we think about it, the “humility of God” is one of the defining truths of our faith. It is amazing and beautiful to reflect on this. In the Incarnation, the Word of God, through whom the universe was created, chooses to become a creature himself. The ruler of heaven and earth makes himself lowly, coming down to become our servant. This is who God is. He is a God who loves us so much that he humbles himself to share in our humanity; a God who reaches down to lift us up; who dies for us, so we can share in his divinity. God’s humility is meant to show us a whole new way to live. To imitate Jesus in his humility — this is how we discover our true humanity. And Jesus commands us to humility in so many different ways. “Whoever wishes to be great among you, should be your servant,” he tells us. But humility is too often misunderstood. It does not mean that we should degrade ourselves or beat ourselves up for our failures and weakness. It is not about feeling inferior or as if we are not worth anything. This is not humility. Saint Teresa of Ávila said that humility is truth. It means knowing who we are, it requires being honest with ourselves. But this is not the whole truth about who we are. In humility we know that we are broken, that we are weak. But in humility we also know that we are loved by God, and that he calls us to walk with Jesus, to follow him and to share in this holiness. That path that Jesus calls us to follow is his path — the path of humility. To grow in humility, we need to start by remembering that everything we have comes from the loving hands of God. We need to call to mind often how much we have been given, how much we have been forgiven, all God’s tender mercies in our life. Striving to be grateful will keep us humble. We become more aware of God’s gifts in our lives and more aware that there is nothing we could ever do to “deserve” or earn his love. Humility means knowing that we need God, that we depend on him for everything. Humility means knowing that with God all things are possible and that we can do all things through the strength he gives us. We grow in humility also by giving ourselves to others, serving others as Christ came to serve us. At the Last Supper, Jesus knelt before his disciples and washed their feet. He serves us, he bows before us, even though we are sinners and even though we are weak. Christ’s love is a humble love, a servant’s love. In his humility, he stoops down to lift us up to him, just as a father bends down to pick up his child. We need to trust in God’s Providence, that he will always provide for us. We need to humble ourselves, giving up our own will in order to serve his will. As the saints tell us, humility means seeing ourselves as a paintbrush in the hands of an artist, trusting in his plan, allowing him to use our lives to serve his purposes. As we continue on our Lenten journey, pray for me this week and I will be praying for you. And let us turn especially in this holy season to our Blessed Mother Mary. In her humility, she offered herself to be the handmaid of God. 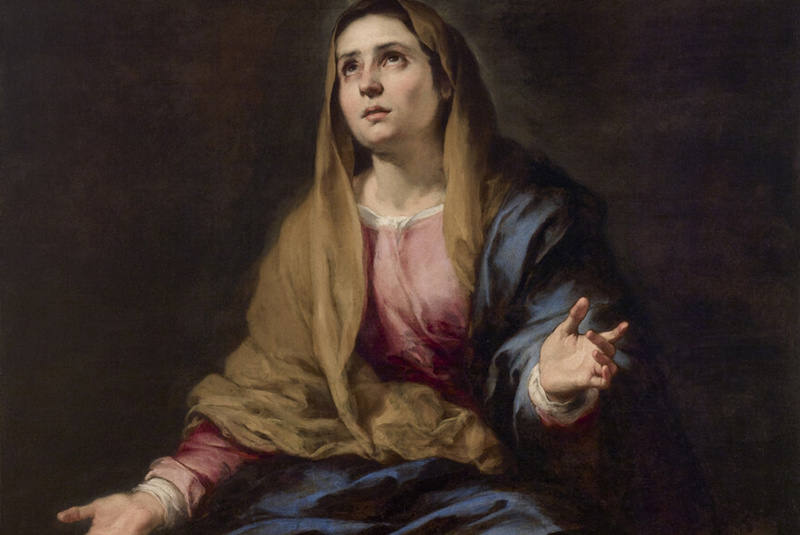 Through her intercession, may God grant us the grace to be humble of heart as she was — and as Jesus calls us to be.